There are a few things that New Yorker’s love – a good drink, a good meal and a good outdoor space. 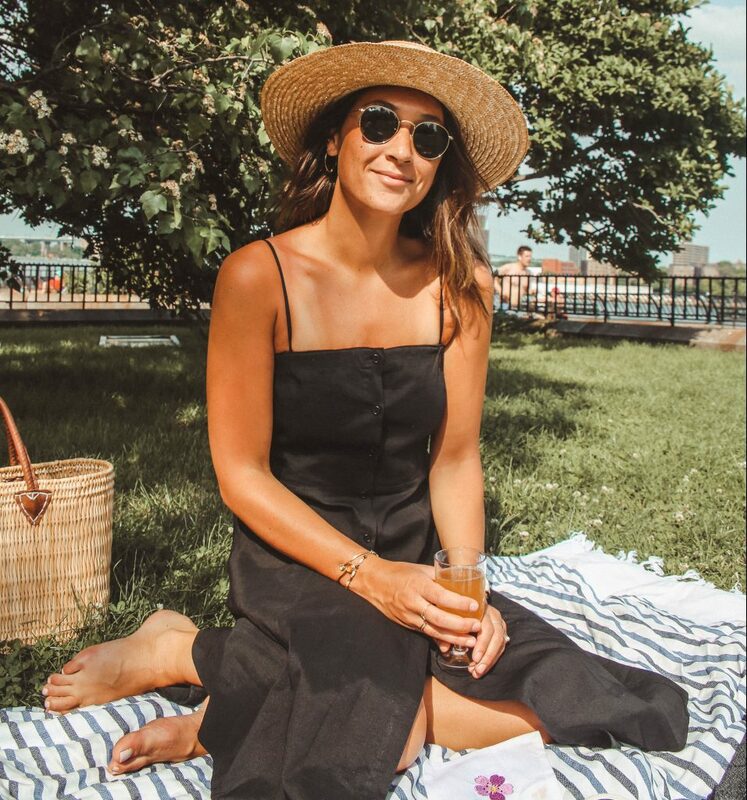 Once the weather starts to warm up even the littlest bit, we’re on the hunt for an outdoor spot to set-up shop for the afternoon with a few friends; whether it’s a rooftop, a garden patio or even a blanket in Central Park. 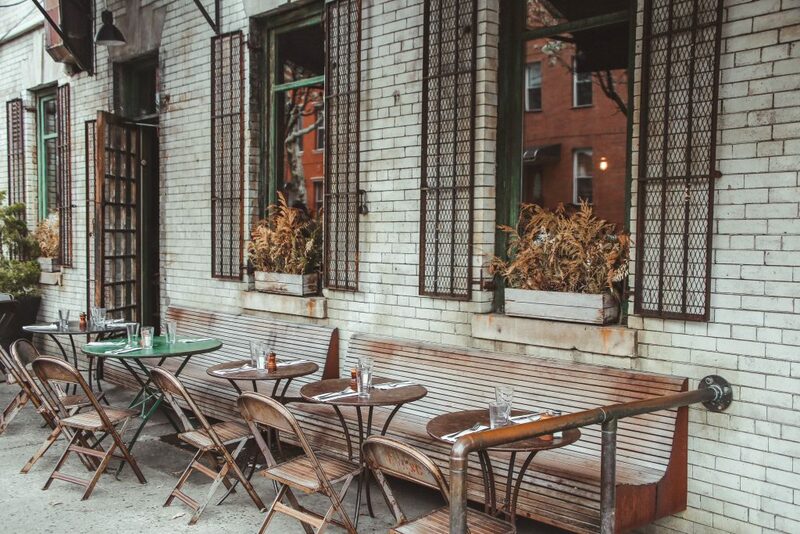 So, now that it’s officially summer in NYC (my favorite season in the city), I’m rounding up some of the best spots for outdoor dining & drinking in Brooklyn, specifically in the Williamsburg, Greenpoint and Bushwick areas! 12 Chairs: Located right across the street from Sunday in Brooklyn, this is a great place to go if you’re not able to get a table at its more popular neighbor, Sunday in Brooklyn. 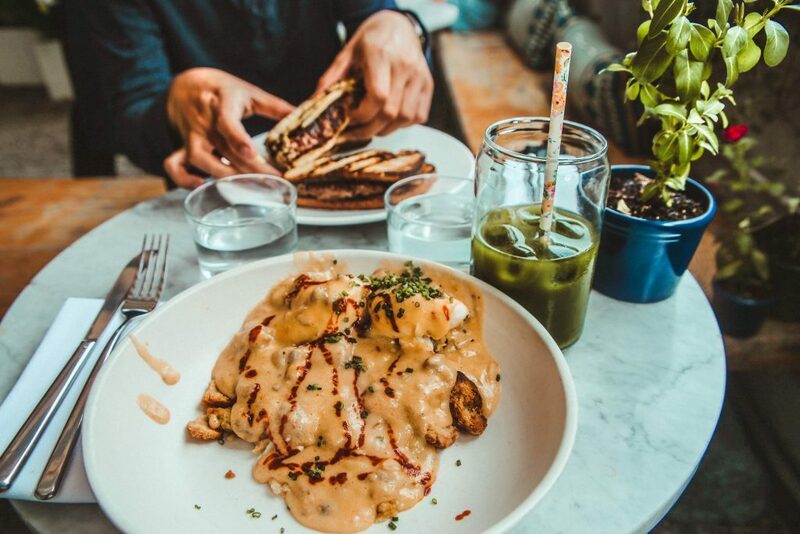 In the warmer months, they open up the windows so that the whole place feels like the outdoors, making it a great option if you want to enjoy the weather, while chowing down on their fluffy pancakes (my personal favorite). Cafe Colette: I love the overall vibe of this place – very relaxed and rustic and almost European, the food here is tasty and the cocktails are unique and interesting. I love grabbing one of the few tables outside and enjoying an afternoon glass of wine. 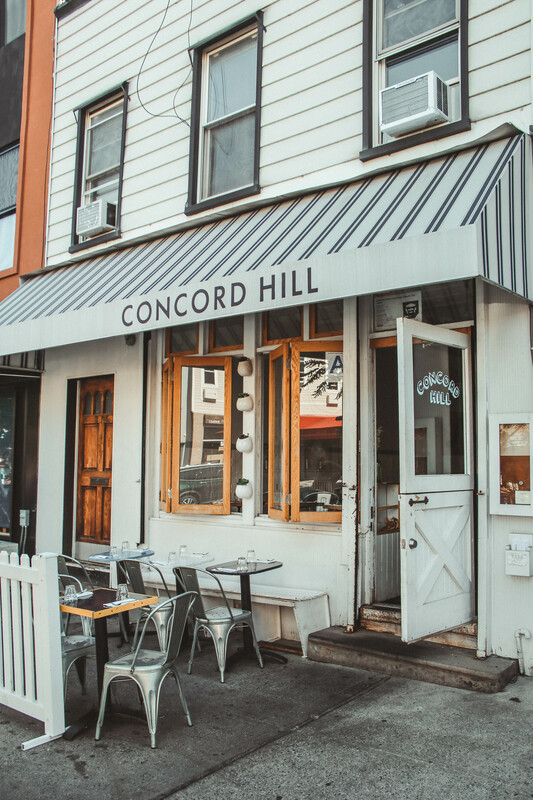 Concord Hill: Located right on Graham Ave, this spot has the good vibes and good food to match; so although the outdoor seating here is limited to only a few tables, if you’re able to snag one it’s a real treat. When stopping by for brunch, I recommend ordering the Loco Moco or the Fried Egg & Cheddar Sandwich (although be careful that it doesn’t get all over your shirt, as it’s just as juicy as it sounds). 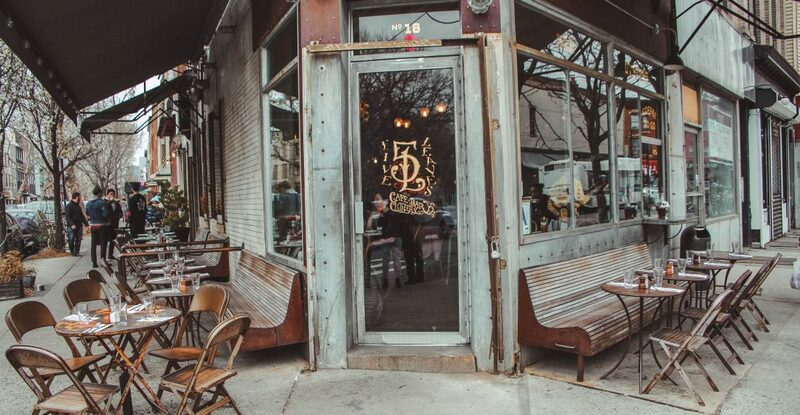 Five Leaves:This spot is situated right on the corner of Lorimer St & Bedford Av – bordering both Williamsburg and Greenpoint and conveniently located right across the street from McCarren Park – making it the ideal location for an outdoor brunch spot. The best part? The food. Though a breakfast sandwich seems like a simple order, you’d be surprised how many places present you with their own mediocre rendition of the dish. Luckily, this place is the complete opposite – every time we go the food is tasty, the environment is inviting and we always leave satisfied. Le Fanfare: Although I didn’t get to sit outside the last time that I was here due to the changing of seasons, I was able to get a peek at the backyard dining area and it is beyond cute. On top of that, the service is spectacular and the food gives you that authentic Italian feel, and who doesn’t love enjoying a pasta dish al fresco like a real Italian? RIDER:Conveniently located within quick walking distance of the Bedford Av train stop, RIDER has a whole slew of outdoor seating right on N 6th St, making it a great spot for an afternoon happy hour drink or small bites. Just be sure to clarify your liquor selections carefully, as we were charged premium prices for what we thought would be a house liquor. Roberta’s: Located right off the Morgan Av stop, this is one of the top pizza spots in Brooklyn, and rightly so; it’s fresh, it’s flavorful and it’s reasonably priced. With a large outdoor space filled with picnic tables in the back of the restaruant, it’s the perfect place to pick up a pie with some friends and enjoy a drink at their outdoor bar. Sauvage: Right across the street from Five Leaves and almost three times the size, your odds of getting a spot outside here are much higher than at their neighbor. 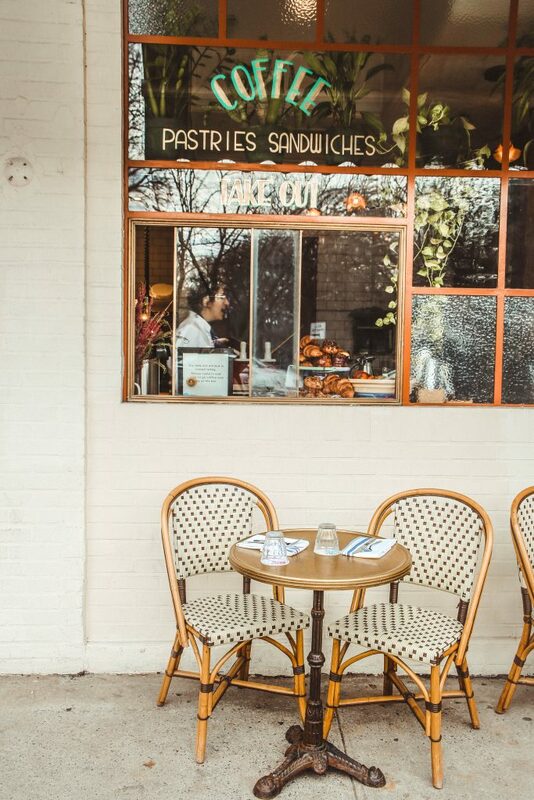 Giving off some serious Parisienne vibes, this is the ideal spot for a late brunch or afternoon cocktails. Sunday in Brooklyn: One of the hot spots in Brooklyn over the past few months, this place is always packed so a reservation is 100% necessary. We were lucky enough to be seated on the rooftop patio for Sunday brunch and it was just cool enough where we were able to fully enjoy the atmosphere (since we all know NYC summers can be brutal). Whether you’re seated indoors or outdoors, this is a must-visit Brooklyn brunch spot! 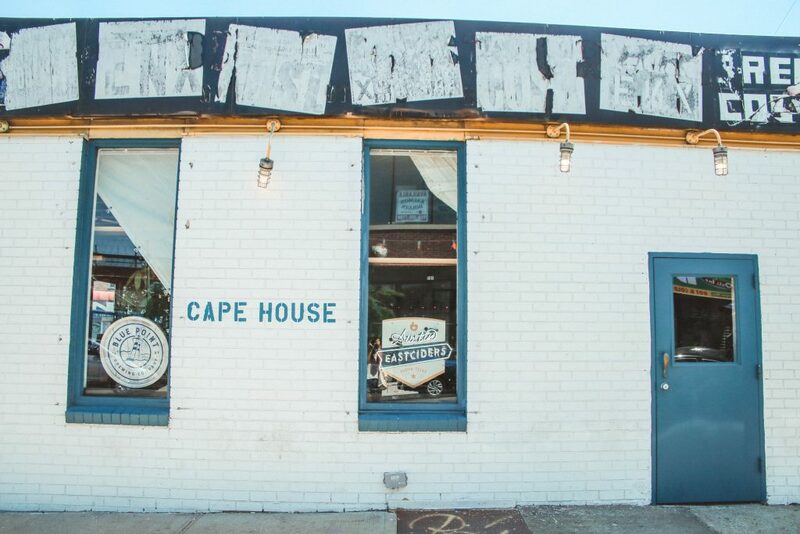 The Cape House: This spot is a little ways away from the subway, but it’s worth the trek. I love coming here in the summer because you’re instantly transported to “the cape”. 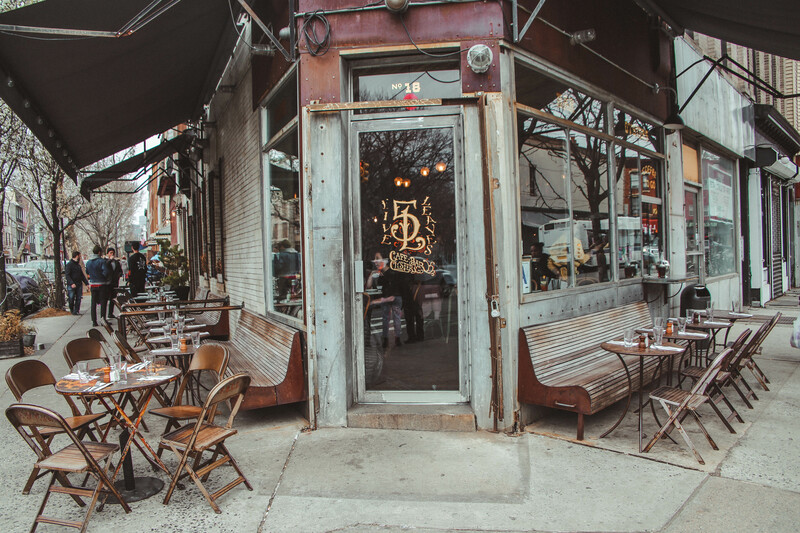 The indoor decor is very beachy and the outdoor bar area with picnic tables make it the perfect spot to grab a drink, order some oysters and transport yourself miles away from NYC. The Springs: Opened only a few weeks ago in Greenpoint, this has become a new go-to spot for my friends and I. Modeled after a Palm Springs hangout, this place is well decorated and has a large outdoor space that (almost) rivals those in the desert. With a range of outdoor seating from cozy couches to picnic tables and even real grass on the floor, this place is great for a day event or a night out.